Nobody likes surprises. One of the things we talk about often is the anxiety a client must feel talking to designers and evaluating designs. Anxiety is high among experienced clients and especially high among clients who are working with designers for the first time. Clients come to designers often feeling that they have their needs all bundled up, ready to go. “It just needs a look and feel,” they might say. Then we as creatives immediately start opening up their minds to all the possibilities. Where do we draw the line? How do you reconcile what the client is expecting with what you intend to provide and believe they truly need? How do you ultimately justify your final design solutions? We believe that the process of managing both clients’ expectations and the internal creative process begins and ends with documentation. Documentation is the secret sauce between the clients needs, market research, and where the rubber meets the road on creative exploration. To a designer’s ears, “documentation” may sound like the tedious paper pushing part of the job we all hate. Rest assured, I’m not talking about another 72 page PowerPoint deck that leaves your head spinning by the time you finish. Rather, this documentation is the creative synthesis of all PowerPoint documents the client and other teams have floating around. The result becomes the definitive, easy-to-reference final document. We call this document a visual Brand Brief when it refers to the overall creative direction and brand strategy. We call this document a visual Creative Brief when we are drilling down into specific project objectives and the targeted design directions to explore. Visual is the operative word here. MSLK believes, either type of brief should visually convey all the information a designer, copywriter, photographer, client, etc. would need to know in order to be up-to-speed on the brand objectives. Ideally, it should be no longer than one page. 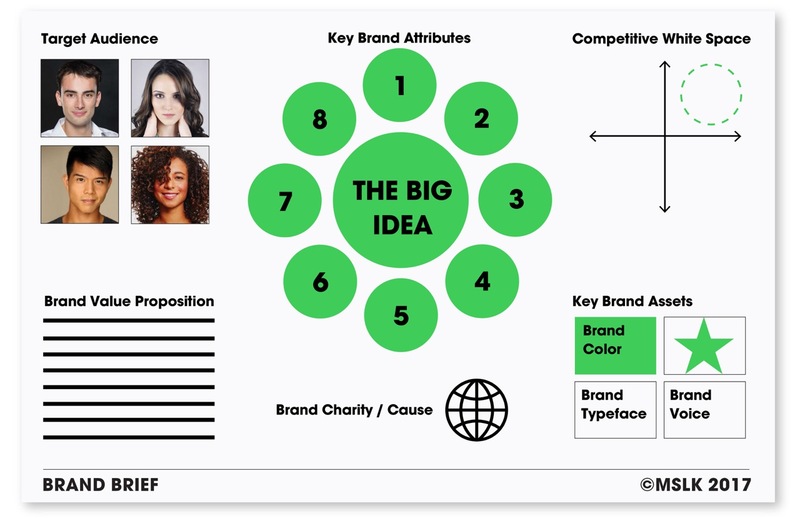 A Brand Brief should document the Brand Value Proposition, white space, customer profiles, existing brand assets, and other brand attributes such as mood, tone, material choices, related causes, etc. Anything that should be kept top-of-mind is distilled onto this page. Yes, that’s a lot of information to cram into one page, but if done correctly, the very act of distilling this information helps focus the client and the creative team on what really matters most. Part of this distillation process is to begin to think visually. After all, a picture is worth a 1000 words. It’s our job as creative thinkers to develop assets that can become shorthand for all the verbiage filling up those PowerPoint decks. Visual references, iconography, stock photography, even sketches may help. This process helps more visually-minded clients gain alignment with your creative team. It determines which concepts can be conveyed with visuals, materials, and overall mood tone. This also identifies concepts which can only be conveyed directly with words. In the end, it does not matter how well designed the document is — simply having documentation is the most important part. These documents are the secret ingredient to managing client’s expectations. It’s a chance for your creative team to absorb all of the information provided and create a shared place both you and the client can point to the objectives of the assignment. The merits of any creative deliverables to follow should be evaluated against this document. In this manner there should be no surprises. The Brand and Creative brief are in place to change the subjective conversation of “Do I ’like’ this creative solution?” into an evaluation of “Does this creative solution answer my creative objectives? The client may not like your creative solutions personally, but if the solution answers the objectives then it should be considered and evaluated on its own merit. The needs of the brand and the target audience come first. A design might still be rejected but it should be done within the context of “Did this design convey the documented strategy, yes or no?” If yes, and we still don’t like it, then it may not be the right fit for the brand. If no, then what can be done to improve the creative in order to better convey the strategy? By using documentation such as Brand and Creative Briefs we can minimize the anxiety clients have working with creative teams. On the creative side, we can leverage these documents to lead our designers towards making better design decisions and our clients towards providing better feedback.